About this object Serving 17 Congresses, Thomas "Tip" O'Neill of Massachusetts spent eight in a leadership position. The Democrats retained control of Congress and won the presidency in the 1976 elections. 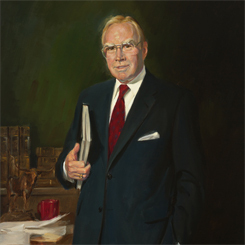 Thomas P. “Tip” O’Neill of Massachusetts succeeded Speaker Carl Albert of Oklahoma following his retirement in 1977. But despite their one-party control of the federal government, Democrats failed to pass President Jimmy Carter’s comprehensive energy program. The 95th Congress (1977–1979) produced only stop-gap energy legislation. Congress reformed the process for low- and middle-income bank loans, deregulated the airline industry, and added more than 150 federal judgeships. On this date, the first live radio broadcast of the proceedings on the House Floor transpired. 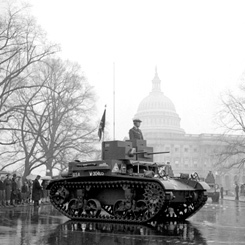 The nation returned to celebrating Veterans Day (Armistice Day) on November 11.